WAYNE, PA--(Marketwired - Sep 22, 2016) - Elemica, the leading Supply Chain Operating Network for the process industries, today launches a new season of their award-winning video series, "Elemicans in Cars Talkin' Supply Chain." Season 3 features an unexpected twist, the inclusion of non-Elemicans -- or The Outsiders. They are from the analyst community or Elemica's customer base, and are supply chain experts, industry consultants, and change agents discussing ideas that challenge current thinking, validate ideas, or present new pathways forward. The presentation style gives the audience an inside look into how business gets done, and how value and innovation are delivered to people on the Elemica network. 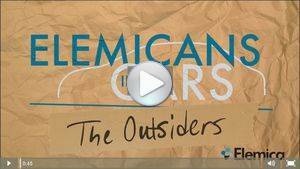 "I'm excited to see our hit web series 'Elemicans in Cars' evolving, mixing it up for season three -- instead of two Elemicans, now an Elemican is joined by a non-Elemican which brings in a fantastic outside-in perspective," said Ed Rusch, Vice President, Corporate Marketing at Elemica. "Stars in the Supply Chain arena like Lora Cecere, Founder and CEO of Supply Chain Insights, and Adrian Gonzalez, President at Adelante SCM and Host of Talking Logistics, are a couple of the great guests who jumped at the chance to be on the show. It's important to hear what thought leaders like them are saying about the industry while assessing the game-changers ahead in today's dynamic market." 1. Top Talent Development - There is a huge need to develop 21st Century Leaders as opposed to nurturing 20th Century Managers. Leaders will vacuum up information, understand it, then turn around and use it, which requires a lot of hard work. Anybody in any position within an organization can exhibit leadership skills by understanding people and what makes them tick; being sensitive, respectable and inclusive; and communicating with appropriate tools with individuals. 2. Desperate Need For Talent - Companies still need people competent in the nuts and bolts of physical distribution, supply chain planning, supply chain execution, and informed analysis. Art says there are a lot of brilliant people, who are clueless about how the real world works, and they need to know how the world works before they try to understand anything worthwhile from things like Big Data analysis, for example. 3. The Internet of Things (IoT) - Art believes IoT will be a significant technology enabler, but doesn't believe it will impact the market as fast as many others imagine. IoT is a network of physical objects embedded with technology that communicate and sense and respond with their external environment. IoT is underpinned by a robust business-to-business (B2B) network, and promises to deliver numerous economic benefits. "Elemicans in Cars Talkin' Supply Chain" was awarded a Gold Stevie® at the 14th Annual American Business Awards for the top prize in the video category for technology sales. The award ceremony was held June 2016 at the Marriott Marquis in Times Square New York. The series was also named a finalist in the Technology Association of Georgia (TAG) Marketing Awards for Best Integrated Marketing Campaign in 2015. Production of the web series is supported by HindLight Media. Episodes from current and previous seasons of "Elemicans in Cars Talkin' Supply Chain" can be seen at www.elemicansincars.com.